The following version of the transcript has been edited for easier reading and comprehension. A raw, unedited transcript is available from our archives. See our homepage at http://www.emforum.org . Avagene Moore: On behalf of Amy and myself, welcome to the EIIP Virtual Forum! Today we will be discussing Standardizing Map Symbols: An Initiative to Improve Communication. It is a pleasure to introduce today's speaker, Scott McAfee. Scott is the GIS Coordinator for the DHS/FEMA Mitigation Division. He helps develop policy and coordinate the geospatial information aspects of a number of FEMA activities and programs, including HazardMaps.gov; Emergency Management Map Symbology; HAZUS; and Multihazard Flood Map Modernization. Welcome Scott, and thank you for joining us today. Scott McAfee: Thanks, Ava, and hello and welcome to all! Before I give the background to this project I'd like to officially announce that the symbols themselves are available for review. This review is not an official step in an accredited standards process, but more to give us some feedback from the user community. I'll give you the Web site URL now, but before you all run off to that Web site to check it out, I should mention that it will take some time to digest, so you might just take a quick look at the different sections. To get to the different sections, click on the boxes in the header, such as "Incidents Evaluation." I'll give you a couple of minutes to explore the Web site. I wish I could look out and see your faces, but I guess I'll just have to assume that you're all smiling and glued to your monitors in anticipation of hearing about "standardized map symbols for emergency management." It's certainly a topic that has interested me. The seed for this initiative was planted back when I worked for the California Office of Emergency Services and responded to a number of disaster incidents. Then, as now, it was typically up to the GIS analysts to choose which symbols from a limited symbol set to use for planning, preparedness, response, and recovery maps. At the incident level, at least you had a (limited) standard set of Incident Command System (ICS) symbols to choose from, but many of those symbols weren't part of the standard GIS programs. Some extensions and customized applications did incorporate them, though. For the mapmakers to pick the symbols on the fly causes a few problems. First, it's a waste of time to have to be creative in a disaster situation. Picking symbols means you have to think like the end-user of the map, choose a simple symbol that communicates as much as possible, and avoid symbols that might be in poor taste. Then you have to think about color, size, transparency, labels  dont get me started about labels. Second, you typically have to choose this symbol from a number of true-type font sets that usually are limited to a particular area of interest. Say you were an emergency manager that needed to map how landslides affected power generation facilities. The symbol for these facilities in the UTILITY symbol set might make complete sense to utility employees, but be completely unintuitive to emergency managers. So I chatted with other emergency managers about how nice it would be to have a comprehensive, standardized set of symbols for the emergency management mapmaker to choose from. This was a difficult project to undertake from a state agency, but when I took a job with FEMA a few years ago, I had the opportunity to foster the development of such a standard from a national perspective. Through our contract with Michael Baker Jr. Corporation, FEMA's Mitigation Division requested a draft report that identified existing symbols and suggested ideal symbols. The report was done (under subcontract from Michael Baker) by Dr. Ute Dymon of Kent State University. It was important to me that a specialist in cartography was involved in the analysis, so I was confident in the approach. I'd also like to note that Jeff Booth of Michael Baker has done a great job coordinating and supporting this initiative as the project manager. After the September 11 attacks, a Homeland Security Working Group (HSWG) was formed by the Federal Geographic Data Committee. This group looked at a draft report put together by Dr. Dymon, and thought it would be an appropriate standard to pursue. At that point, my involvement in the initiative became a smaller part of a much larger, well-coordinated effort. 3) Explore the interoperability of emergency map symbology. The graphic symbols that Ute Dymon of Kent State had drafted have gone through a number of iterations. The following link breaks down the hierarchy of how the symbols are categorized. So, there are categories, themes within the categories, and features within the themes. Each get symbols. We could have done more than three tiers, but decided for the sake of sanity to cut off there. Any additional information can be captured as attributes of the feature, at the users discretion. Those attributes can then be applied as labels, for example. The Symbology Subgroup was very active in vetting all of the symbols, and cartographers at the Census Bureau, with support from University of Maryland, Baltimore Campus, did a fabulous job of interpreting the subgroup's ideas and graphically improving upon the original symbols. The next link shows ways in which an individual symbol can be put in a frame to show the status of that symbol in terms of damage to the facility or at what level it is functioning. Using this method, for example, we might show a power generation facility as non-operational by putting the level four frame around the power generation facility symbol. At this point I should note that the Web site was designed by the Bureau of Census, and hosted by the FGDC. Comments provided through the site will be analyzed by Ute Dymon of Kent State University, and those comments will be taken into consideration and the symbols revised as necessary. Census did the graphics, as well. We've always figured that there needs to be a review of the symbols by emergency managers and first responders at the state and local levels, and this site is the manifestation of that requirement. There will likely be another chance to review the symbols as part of the official standardization process. Our period for review of the symbols through this website is December 8th 2003 through January 31st 2004. For outreach, we will be notifying a number of organizations such as the National Emergency Managers Association, the International Association of Emergency Managers, the Open GIS Consortium, and others. If you have ideas for other groups, please forward them to me at my e-mail address: [email protected] . This has been a difficult part of the process, since there are so many paths to choose from. Choices include FGDC, ANSI, ISO, Industry, and variations and combinations of these. We are still evaluating what to do here, but one of the most promising avenues is to bring this standard through ANSI by way of an existing U.S. Army Corps of Engineers sponsored standard known as "Spatial Data Standards for Facilities, Infrastructure, and Environment." Among other advantages, SDSFIE is FGDC and ANSI INCITS L1 compliant. It also has an annual update process that might facilitate incorporation of the symbols. Let's use my previous example and say that you're a utility worker sent to work a disaster. The emergency management symbol for the feature: "power generation station" is not one that you're familiar with being used in the industry. Is there a way to generate different symbols for such a feature based on the symbol that a person might be used to? It would take a system of Internet registries, catalogs, style descriptions, graphic descriptions, and standard, cross discipline, feature definitions. 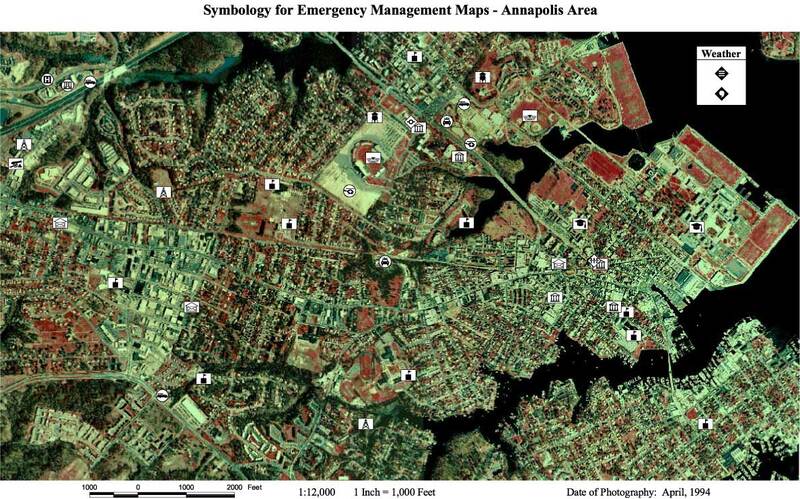 The Open GIS Consortium is undertaking a project known as Emergency Mapping Symbology (EMS) that will explore this issue. The goals of the project are to mature a number of specifications of the Open GIS Consortium and explore their application for two symbol sets: Those of this FGDC group as well as the set from a Department of Defense application known as Geospatial Symbols for Digital Display (Geosym). FEMA is co-sponsoring this project with the National Geospatial-Intelligence Agency (NGA, formerly NIMA). A Request for Quotations and Call for Participation are available for this initiative from http://www.opengis.org , with the deadline of December 16th. Forgot to credit the other agencies and organizations that are involved. I believe they are on the background page. Jason Moats: Can we get these symbols to use currently? Scott McAfee: Good question. We haven't yet discussed when to officially release the symbols. It at least won't be until we've gone through this review process to see what the community thinks. We don't want people to adopt the symbols only to have them change significantly. Joanna Grossman: Often symbols have to be small. These are so detailed, I'm worried they won't be legible. Scott McAfee: Great point, Joanna. A lot of emergency maps use shape symbols such as circles or squares. If your maps are too small for the symbols to be legible, just use the shape of the category. That way at least you'll know whether it's an incident, infrastructure, etc., and you can label it how you wish. Jason Moats: I have the possible availability of a test bed to get some real application evaluation. If I could get them to use in a training project, we'll put them through their paces. Is the project open for something like this? Scott McAfee: Jason, go ahead and send me an email and we can discuss. Rodney Rogers: City of Portland, OR officials have determined a major earthquake will separate the region into 5 areas, knocking out all bridges. Will symbols indicate vulnerable structures such as these? Scott McAfee: The context of your map will be the important part of that communication, I suspect. You can use the symbols for any purpose, and indicate levels of vulnerability as you like. Mike Morrow: What are your plans, if any, for standardization of lines and polygons to represent things like evacuation areas? Scott McAfee: I knew someone would ask that, Mike. We really wanted to keep it simple, so we steadfastly stuck to point symbols. If we are successful with points, and have funding to continue, we will do lines, polygons, and symbols for other communities of homeland security. Ingrid Aldridge: What timeline are you looking at for finishing the project to the point where you will have the symbols available? Scott McAfee: I suspect the symbols won't be officially available until they are an official standard. This might take some time, and the Working Group might have to discuss how we handle unofficial releases of the symbols. Amy Sebring: Scott, have you considered changing the background colors as opposed to changing frames to indicate levels? I would think that might show up better? Scott McAfee: Kaile, want to take that one? Kaile is from Census, and handled the graphics. Kaile Bower: Sure. We decided on using color only in the frames in order to facilitate the use of the symbology in both color and black and white. Because the frames have both a texture and a color they work in both realms. Ingrid Aldridge: What format will the symbols be in? Useful for multiple GIS software? Scott McAfee: Kaile can correct me if I'm wrong but I think they're in CGM now, and we plan to do True Type fonts and SVG. Also, we're hoping the GIS vendors will step up and incorporate the symbols into their applications. Kaile Bower: We will also be providing symbol sets in a couple of popular GIS software package formats. Avagene Moore: Scott, have you fielded the symbols with any user groups yet, even on a limited basis? If so, what type of reactions are you getting? Scott McAfee: Kaile can again help on this. We had a limited pilot in Maryland and Los Angeles last month to test the Web site. The LA folks were busy with fires, of course. Kaile Bower: In our initial sniff test we had a total of 49 responses that were overwhelmingly positive. Jim McConnell: Might a concurrent project be standardized abbreviations since labels may always be needed? Scott McAfee: We have a catchall category for attributes. You can use any attributes you wish, including abbreviations. A larger question you might be leading to is standardizing a data structure for these symbols which may happen in the future. Joe Sukaskas: Some of the symbols are defined as Themes, others as types of Features. Are the features simply subsets of themes, or are there other reasons or applications for the differentiation? Scott McAfee: Good question, Joe. Features are subsets of themes, but you can use a generic theme symbol if you like. Themes are contained in categories. Amy Sebring: Scott, are you aware of any fora specifically for folks interested in GIS for emergency management, either formal or informal? Such as a mailing list? If not, do you think it would be useful? Scott McAfee: None that I'm aware of. There are usually Tracks at GIS conferences devoted to Emergency Management (or Homeland Security) so a forum would probably be popular. Lauren McLane: Some areas do have these GIS in EM groups. Try contacting your GIS Coordinator at the FEMA Regions. Scott can probably help with that. Scott McAfee: I think that's a good question for our audience. Anyone doing that? Thanks, Lauren. Lauren McLane: We are in New England  informally. Scott McAfee: Lauren is with our FEMA Region 1 office in New England. Chuck Zechman: Are there plans to track incidents using maps & symbols real time on regional, state, and national level? Scott McAfee: I think that's the ultimate goal that's in every GIS savvy emergency managers mind. And I think the interoperability piece will be helpful for the future success of that. Rodney Rogers: More & more of our Red Cross volunteers are using GIS to find accommodations for displaced clients in the field. We are currently installing satellite networking for communication. Isabel McCurdy: Will these standard GIS symbols transcend over to signage internationally? Scott McAfee: We've talked about ISO for an international standard but feel we really need to focus on the US first. We can evolve to ISO later. As far as signs, Kaile can tell you that signs work different from map symbols. The DOT HazMat placards don't work well as map symbols, for example. But maybe? Johanna Meyer: Is there going to be symbology for (MEDS) building foot prints or will point symbols be the standard? Scott McAfee: You mean the Homeland Security Infrastructure Program (HSIP) features? Scott McAfee: Great question. One of the advantages of using the SDSFIE standard is that there is some exploration of incorporation of HSIP into SDSFIE. So harmonizing the HSIP features with the symbol features would be made easier (but not easy). Bob Bilder: I dont see map symbols for biological issues like amount or types of populations (animals, people) affected, disease types or a way to track the density of the ill in a biological outbreak. Scott McAfee: Good point, Bob. Please visit the Web site, give the symbols your review, and put those comments in at the end. They will be considered. Kaile Bower: Scott, if I may, I see these things coming into play when we get to areal features. Since you can't have density without area. Scott McAfee: Right, Good point, Kaile. Avagene Moore: That's all we have time for today. Thank you very much, Scott, for the excellent presentation and very good information. Please stand by a moment while we make some quick announcements. Thanks to everyone for participating today. Our session is adjourned but before you go, please help me show our appreciation to our speaker, Scott McAfee, for a fine job. And thanks to Kaile and Lauren for being here and adding to the discussion. Scott McAfee: Thanks for having me. Kaile Bower: Thank you. I look forward to seeing all the responses to the evaluation!